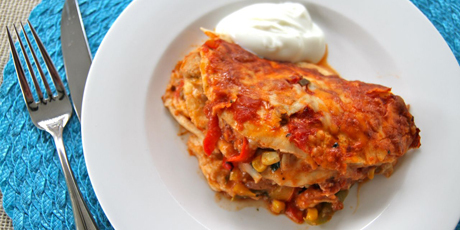 Fajitas make for a fun dinner when everyone wants to assemble their own, but if you are looking for a make-ahead tasty meal to feed a crowd, this version of lasagna, which uses tortillas in place of pasta, definitely fits the bill. 1. Preheat the oven to 375oF. 2. Heat the oil in a large sauté pan over medium high heat and add the onions and peppers, cooking until they just begin to soften, about 3 minutes. Stir in the garlic and chili powder and then add the chicken, cooking all the way through, about 8 minutes. Stir in the coriander and lime juice and season to taste. 3. To assemble the “lasagna”, spoon a little salsa into a large oval dish, spreading to coat the bottom. Lay 2 tortillas over this (it’s OK for them to overlap) and top this with half of the chicken fajita mixture. Top the chicken with salsa and a third of the cheese. Repeat layering with 2 tortillas, the remaining chicken, more salsa and another third of the cheese. Finish with a final layer of tortillas, salsa and the remaining cheese. Bake this, uncovered, for about 30 minutes, until the cheese begins to brown and the edges are bubbling. Allow the “lasagna” to cool for 10 minutes for scooping to serve. A brand new Iron Chef has been announced for the holidays and it’s Canada’s baking sweetheart. This holiday drink is meant to warm you up as you make your way around the Christmas market stalls, chatting and shopping and will ensure you won’t get cold.